Professor Dr. Bhola Thapa, Dean, School of Engineering delivered following two presentations in the special session of the 1st Asia-Pacific Forum on Renewable Energy (AFORE-1), held in Korea during 16-19, November 2011. Mr. Biraj Singh Thapa, Research Fellow at Turbine Testing Lab also presented the following paper in the same conference. The paper was honored with the best paper award by the organizing committee. Confucius Institute at Kathmandu University (CIKU) holds Chinese Proficiency Test (HSK) on December 4th , 2011. All together 51 people sat in the tests. The purpose of the test is to “promote training through testing” and “promote learning through testing”. The HSK emphasizes the objectivity and accuracy of the evaluation and stresses the learners’ actual Chinese language abilities. The HSK sets clear test objectives to allow the test takers to be able to improve their Chinese language abilities in a systematic and efficient way. As a general Chinese language abilities test for adult learners，the results of the test can serve several purposes, i.e. a reference for an educational institution’s decision-making concerning recruiting students, a reference for employers’ decision-making concerning the recruitment, training and promotion of test takers, a method for Chinese language learners to assess and improve their proficiency in Chinese, and a method for Chinese language training institutions to evaluate training results. Test takers will receive the results for the HSK issued by Hanban within three weeks after the test. On November 16, 2011, Confucius Institute at Kathmandu University(CIKU) held the Ceremony of Donating Book to Kathmandu University, through which, there are over a thousand Chinese books were donated. H. E. Chinese Ambassador Yang Houlan to Nepal, Prof. Dr. Suresh Raj Sharma, Vice Chancellor of KU, Prof. Dr. Bhadra Man Tuladhar, Registrar of KU, Prof. Bao Deyuan, Director of Confucius Institute along with some teachers and students in KU, CIKU, attended the book-donating function. The function was hosted by Prof. Bao Deyuan, Director ofConfucius Institute. H. E. Ambassador Yang Houlan addressed in his speech that the friendship between China and Nepal comes from culture exchanges. Owing to the mutual support and mutual help since the establishment of diplomatic relations of the two countries, the bilateral relations keep developing smoothly and healthily, among which, educational cooperation is an essential part. He is very pleased to see that more and more Nepali friends choose to learn Chinese language and culture and hopes the books donated today will be helpful for the readers to know better about China. On behalf of the KU teachers and students, Prof. Dr. Sharma, Vice Chancellor of KU expressed his gratitude. He said that the friendly cultural exchanges between China and Nepal have a long history and huge potential. China, once an ancient civilization, however, a fast developing country nowadays, is worthy to be learned by Nepali people, especially the youth. He believes the students will know more about China and do great contribution to enhancing the friendship and cooperation between the two countries with the help of these books. H. E. Ambassador Mr. Yang and Vice Chancellor Prof. Dr. Sharma also discussed about expanding academic exchanges and cooperation between the Chinese and Nepali universities. Moreover, Vice Chancellor Prof. Dr. Sharma showed H. E. Ambassador Yang around the Kathmandu University in Dhulikhel. 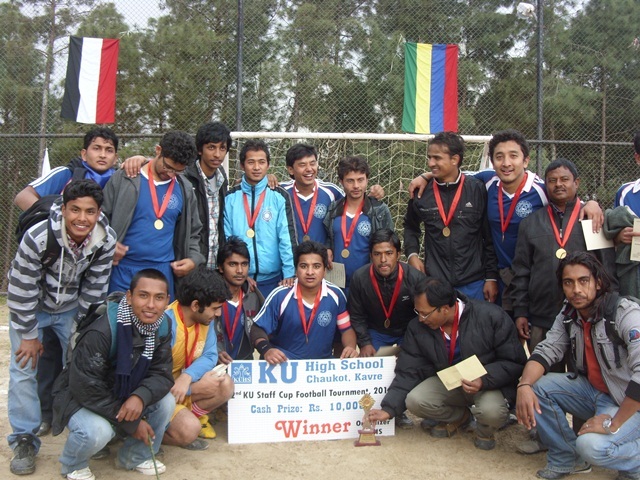 Kathmandu University(KU) central staff team won the 2nd staff cup football tournament held on Nov 16, 2011, which was organized by Kathmandu University High School(KUHS), Chaukot. In the final central KU staff team played with KUHS staff team and winning goal scored by Basanta Lamichhane from central KU Staff team side. The team was awarded by the trophy and cash prize of NRS. 10,000/- Team manager Prachand Man Pradhan received the awarded money on behalf of the team. KU Central staff team led by Sushil Shrestha (captain) won the first match against Dhulikhel Hospital(DH) staff team. Damodar Dhital scored the only goal for KU staff team. 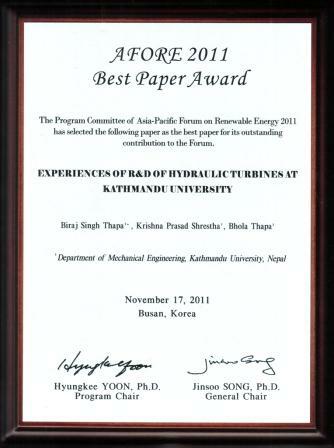 Mr. Subash Ghimire presented the following paper in 2011 the international Symposium on Advanced Engineering, 10-12thNovember 2011 held at Busan, Korea. It is notified to all concerned that CHEM 208 and CHEM 209 (Old Courses) are not offered any more as regular courses. All students who want to appear in these two courses are asked to fill up the examination forms to appear in the forthcoming compartmental examination. Also note that these will be the last examinations in these courses and no examination will be held afterward. 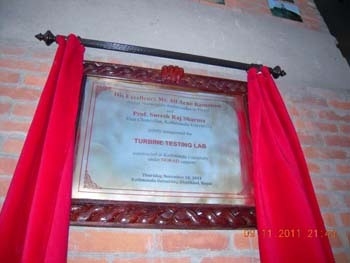 Turbine Testing Lab (TTL) at Kathmandu University was inaugurated on 10th Nov 2011 jointly by Norwegian Ambassador H.E. 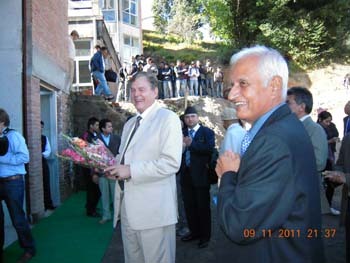 Mr. Alf Arne Ramslien and Vice Chancellor of Kathmandu University Prof. Suresh Raj Sharma. This lab is established with major objective to facilitate academic and development activities related to Hydropower. It is collaborated and built under major support by NORAD. Distinguished author and statesman Dr Karan Singh was conferred honorary Doctor of Letters (D Litt) degree by Kathmandu University on Sunday. 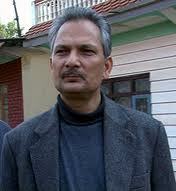 Singh was presented the degree by Prime Minister Baburam Bhattarai, at the university’s 17th convocation ceremony. “Dr Singh is an eminent scholar and we had been planning to invite him here. But it got delayed due to the political problems in Nepal,” said Mahesh Banskota, Dean (School of Arts), Kathmandu University. In his speech, Dr Singh remembered his wife Yasho Raj Laxmi, who belonged to Kathmandu. He mentioned how he got yash (fame), raj (power) and lakshmi (money) after marrying her. KATHMANDU: Karan Singh, an eminent scholar and a Congress leader, was conferred honorary D Litt by Kathmandu University on Sunday. He was presented the degree by Prime Minister Baburam Bhattarai, who is an ex-officio chancellor of the university. The first recipient of the honorary D Litt degree from the university, Singh was the chief guest and delivered the 17th convocation speech on the occasion. In his speech, he remembered his wife Yasho Raj Laxmi, who belonged to Kathmandu. She died two years ago. From Shirish B Pradhan Kathmandu, Nov 6 (PTI) Congress leader and Rajya Sabha MP Dr Karan Singh was today conferred with Doctor of Literature (DLit) by Kathmandu University. Prime Minister Baburam Bhattarai conferred the title on Singh during the convocation function of the university at Dhulikhel, 60 km east of capital. On the occasion, a total of 848 students of Kathmandu University (KU) received their graduation certificates at the convocation. Prime Minister and Chancellor of the university Dr Bhattarai felicitated the students and asked them to use their skills and knowledge. Singh in his brief remark said that this is an era of science and technology and asked all the students to use their talents in an effective way so that the country would benefit. Singh, who is also the President of Indian Council for Cultural Relations (ICCR), had visited Nepal as the Special Envoy of the Indian Prime Minister in April 2006, when the People's Movement was reaching the climax. He is also attributed to have played some role in peaceful power transfer from then absolute monarch Gyanendra to the political parties of Nepal at that time. Kathmandu, NOV 06 - Expressing his deep concern over the increasing trend of brain drain, Prime Minister Baburam Bhattarai has urged all the Nepali people to stay and work in Nepal. Addressing the 17th Convocation of the Kathmandu University in Dhulikhel, Kavre district on Sunday, the prime minister said the responsibility to take the nation from dependency to self-reliance has come upon the shoulder of fresh graduates. Saying that the peace process has arrived at its final phase, PM Bhattarai urged the students not to leave the country in search of jobs as the country would be in need of skilled manpower after the peace. He expressed his worry about the classification of education and admitted the difficulty in making the same education to everyone. “I am ready to pay any price to establish an equal education system throughout the nation,” he further said. Altogether 848 students felicitated at the convocation ceremony. Meanwhile, former Central Minister of India, Dr. Karan Singh, was conferred an honorary doctorate degree by the university. Singh is the second person and first non-Nepali to receive the honorary degree from the university. 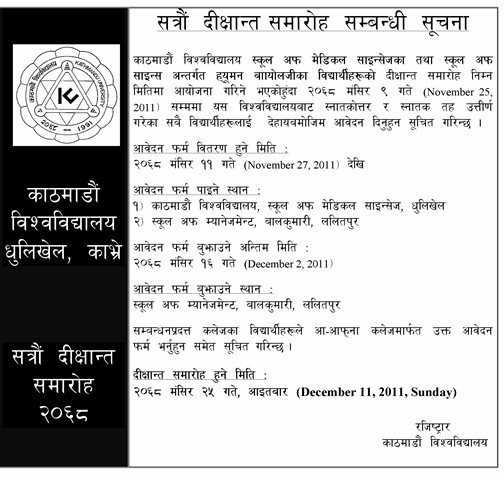 Department of Languages and Mass Communication, Kathmandu University (DoLMC, KU) and Martin Chautari (MC), Kathmandu, are jointly organising third annual Media Research Conference on 1-2 April 2012 (19-20 Chait 2068) with the aim of bringing together researchers. Through this conference the organizers hope to augment critical and interdisciplinary discussions on various aspects of Nepali media. We welcome presentations of research papers based on recent researches. û Abstract, research paper and presentation could be either in Nepali or English. û Research abstracts (not exceeding 500 words) along with 2-page (max.) 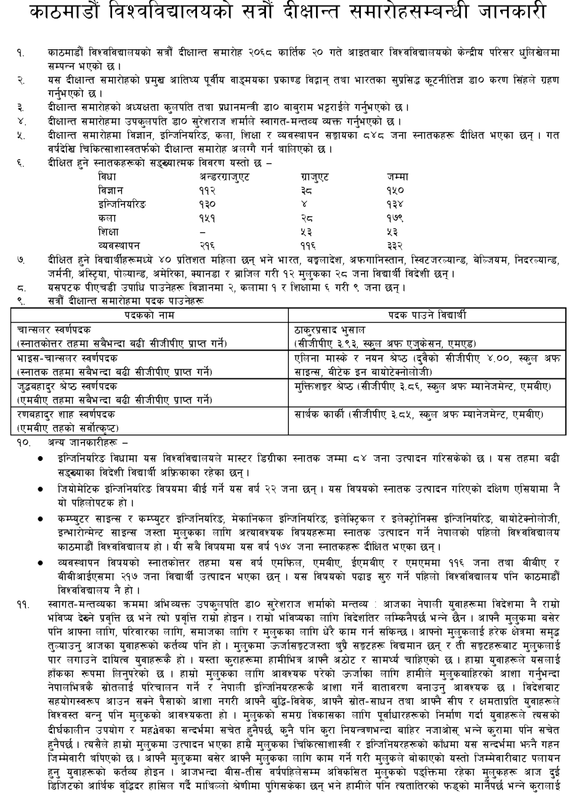 curriculum vitae should reach DoLMC or MC latest by 14 January 2012 (30 Poush 2068). The abstract can be sent by email, post, or hand-delivered to the DoLMC or MC. 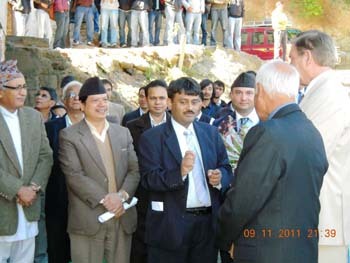 û Decision on submitted abstracts will be conveyed by email by 25 January 2012 (11 Magh 2068). û Final paper should be submitted by 18 March 2012 (5 Chait 2068). û No remuneration will be provided. However, outstanding papers will be published in the publications of DoLMC and Martin Chautari. û Travel fair (bus), food and accommodation cost of those participating from outside Kathmandu (but from within Nepal) will be borne by the organizers. 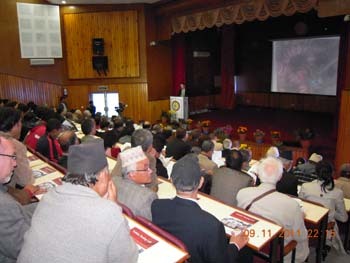 Date and venue of the Conference: 1-2 April 2012 (19-20 Chait 2068), Dhulikhel, Kavre. Details about the conference can be obtained from:Nirmala Mani Adhikary, Hem Raj Kafle and Khagendra Acharya from Kathmandu University or Devraj Humagain, Harshaman Maharjan and Arjun Panthi from Martin Chautari .